Though marijuana is currently considered an illicit substance by the federal government, attitudes toward de-criminalization are shifting quickly towards support. In 2016, approximately 57% of Americans thought that marijuana should be legal, almost double the 32% who supported in 2006. It’s no wonder then that marijuana is the most frequently used illicit drug in the United States and is rising. However, over the last 30 years, a shrewd and expensive lobbying campaign has pushed public attitudes about marijuana away from psychiatrists and epidemiologists science of marijuana’s dangers. Due to the change in public attitude toward marijuana, many companies with a company-wide drug testing program are considering dropping marijuana from their drug testing program. Over an employee’s career, employers will invest hundreds of thousands of dollars in wages, training, benefits and professional development. Employers must also create an engaging, safe and productive work environment in order to produce a return on that investment. Before moving forward with dropping marijuana, we wanted to present an analysis of your company’s likely Return of Investment (ROI) for testing THC in the workplace and show that allowing employees to use THC in the workplace hurts that ROI. We will tackle this ROI in three main segments: hiring, employee health, and lost time. Before we dive into the ROI analysis for having THC in your drug test program, let’s quickly discuss the current state of marijuana in the United States. Thanks to sophisticated farming, cloning techniques and demand by users, cannabis produces a stronger high more quickly. In the 1970s, marijuana had a content of THC (marijuana’s active ingredient) of about 1 percent. Today, marijuana routinely contains 20 to 25 percent THC. With marijuana use growing, so is marijuana drug test positivity which increased 20% in Colorado and 23% in Washington, both states where recreational marijuana use is legal from 2013 to 2014, according to Quest. According to U.S. SAMHSA 2015 study, as many as 50% of people who smoke marijuana daily will become addicted. Widespread use of marijuana is making our roads more unsafe. A roadside study of reckless drivers who were not impaired by alcohol, showed that 45% of these drivers tested positive for marijuana. Also, a May 2016 report found that, in Washington, fatal road crashes involving marijuana has doubled after legalizing the drug. Marijuana’s lobbying campaign have told you marijuana has many different medical uses. In reality marijuana and THC, its active ingredient, have been shown to work only in a few narrow conditions. They are most commonly prescribed for pain relief but they are rarely tested against other pain relief drugs like ibuprofen. In July, a large four-year study of patients with chronic pain in Australia showed cannabis use was associated with greater pain over time. Most of all, advocates have told you that marijuana is not just safe for people with psychiatric problems like depression, but that it is a potential treatment for those patients. But a mountain of peer-reviewed research in top medical journals shows that marijuana can cause or worsen severe mental illness, especially psychosis, the medical term for a break from reality. Teenagers who smoke marijuana regularly are about three times as likely to develop schizophrenia, the most devastating psychotic disorder. The science is being overshadowed by the loud voice of marijuana advocates and the science will raise more concern as mainstream marijuana use increases. It is widely understood that, in the United States, more than 70% of substance abusers are employed. With marijuana being the most frequently used illicit drug in the United States, among working adults, nearly 2% were dependent on marijuana. It is only a matter of time when these statistics affect your employees, but when it comes to hiring, it is becoming more difficult to find qualified employees, especially in safety-sensitive or federally regulated jobs. So, let’s put some numbers to the hiring issues with Marijuana. With a calculator from the National Safety Council, our employer scenario is a construction company in Oregon (where recreational marijuana is legal) with 100 employees. Many of these companies have a company-wide zero tolerance of substance abuse in the workplace. According to the calculator, if this company didn’t have this company-wide policy, there will be 2 employee turnovers due to testing for THC and 3 employees and 3 family members that may be affected by a marijuana use disorder. The cost of replacing an employee can range from 25% to 200% of their annual compensation. The cost for job turnover and re-training will cost nearly $15,000 for the employer annually and could be many time more, depending on the job. But the number of Americans who use cannabis heavily is soaring. In 2006, about three million Americans reported using cannabis at least 300 times a year, the standard for daily use. By 2017, that number had nearly tripled, to eight million, approaching the twelve million Americans who drank alcohol every day. Put another way, one in 15 drinkers consumed alcohol daily; about one in five marijuana users used cannabis daily. Researchers have studied alcohol and violence for generations, proving that alcohol is a risk factor for domestic abuse, assault, and even murder. Far less work has been done on marijuana, in part because advocates have stigmatized anyone who raises the issue. But studies showing that marijuana use is a significant risk factor for violence have quietly piled up. The first four states to legalize marijuana for recreational use were Colorado and Washington in 2014 and Alaska and Oregon in 2015. Combined, those four states had about 450 murders and 30,300 aggravated assaults in 2013. In 2018, these states had almost 620 murders and 38,000 aggravated assaults—an increase of 37 percent for murders and 25 percent for aggravated assaults, far greater than the national increase, even after accounting for differences in population growth. When it comes to the workplace, over 65% of all accidents on the job are related to misuse of drugs or alcohol. SHA reports that 10 to 20% of the nation’s workers who die at work also test positive for drugs or alcohol. Substance abusers are also responsible for 40% of all industrial fatalities. So, let’s put some numbers to the employee heath with Marijuana in the workplace. With the same calculator and previous employer scenario health care costs annually will include 4 days of an employee/s in the hospital, 5 emergency room visits, and 7 outpatient visits. If there was no company-wide drug testing for this company, they would face $13,000 annually in healthcare costs. In addition to healthcare costs, this company would face 73 days of work off by their employees due to substance abuse, and at least 1 employee error involving an incident or safety risk in the workplace annually. This company would face an additional $18,500 annually for lost time. In total, a construction company with 100 employees would face nearly $50,000 annually for employing substance abuse in the workplace. Add to this cost the additional legal and financial liabilities attached to a dismissal that is associated with drug use or a workplace injury. A company in our scenario, depending on many variables, might have a drug testing program that costs them 5% of the substance abuse in the workplace costs, saving them tens of thousands of dollars annually. If you could significantly reduce your turn-over and risk liabilities, would it be worth it investigate whether a random drug and alcohol testing program could be beneficial to your business or keeping marijuana a part of your drug testing program? Workforce drug and alcohol screening has become an important tool for companies to help reduce these common effects of misuse in the workplace. 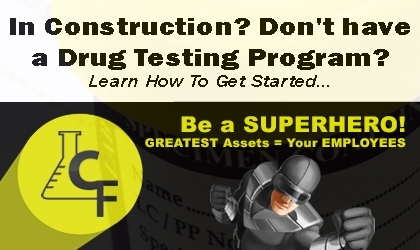 At CleanFleet, we can help you customize this program (types of drugs tested, type of testing methods, and types of testing frequency), and even manage the program for you. Let CleanFleet take the work and worry out of managing your Workforce Drug & Alcohol Screening program. Call us today to arrange a consultation with our expert staff at 503-479-6082. There are 0 comment. on "A Return of Investment Analysis of Testing for THC in the Workplace"